Adbrite was a one of the best online earning option for most of the bloggers and web masters. It was the one of the best AdSense alternative too. The site was working pretty good and the payments were done until now routinely. However at the end of the January the company mentioned that they are going to shut down the company. When the shutting down occur.....? According to the Emails send by the company it is mentioned that they will close the company at the end of the January(February 1st). By now the URL(www.adbrite.com) of them is not working and it gives a clue of their shut down has done already. They have not mentioned any specific reason for the shut down yet. Also they paid their publishers well with out scamming up to now. So, their is no any clues about brake down of their business. What happen to the publishers....? There were thousands of publishers who have join handed with the business. The company already issued 40 millions so far for their publishers. But, what happens to the publishers is a big problem. 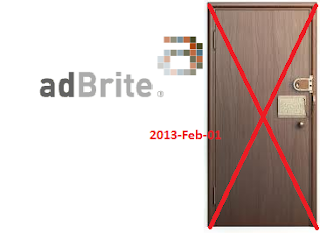 Surely you may have to find good alternative for AdBrite soon.